I don’t want to give exact quantities for this recipe, because only you know how spicy, saucy, or cheesy you like your pizza. I generally use four slices of bacon, 1 1/2 cups of shredded cheese, and a whole lot of pickled jalapeños. Place a pizza stone on the bottom rack of the oven and preheat the oven to 500 degrees. Let the oven preheat for at least 30 minutes and preferably 1 hour. While the oven is preheating, cook the bacon in a skillet until crisp. Drain and set aside. Place a sheet of parchment paper on a rimless cookie sheet or pizza peel. Place the dough on the parchment and roll it out, flouring the top as needed, until very thin (⅛ inch) and about 12 inches in diameter. It’s fine for the dough to stick to the parchment. 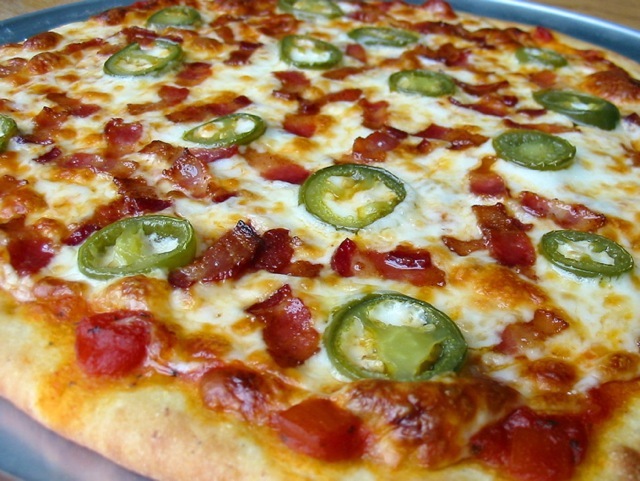 Top with tomato sauce, cheese, bacon, and jalapeños. Trim the parchment so only a small amount protrudes beyond the edge of the pizza. Slide the pizza, parchment and all, onto the pizza stone. Bake 6 to 7 minutes, or until the cheese is bubbly and well browned.